My husband, Wally, and I have just returned from France and I can hardly express what a great time we had. One of the highlights was meeting with Sylvain Fadat at his vineyard in Montpeyroux. His Domaine d'Aupilhac Montpeyroux is one of our favorite wines. It's the favorite at our wine tastings, too. And, after meeting him, it's obvious why his wines are so good. Sylvain is an artisan. His enthusiasm for his wine and life shows in everything he does. He even farms organically. It takes a lot more work, but it improves both the quality of the wine and the environment, so he wouldn't have it any other way. You should hear his stories of the scare tactics the chemical companies use to try to sell him their product. Luckily, he knows better. He took us on a tour through his cave and his vineyards. We met his lovely wife, tasted wines, and then he insisted on taking us to lunch! Oh yeah, he also gave us a couple bottles of his wine not available in the US. If you haven't tried his fantastic Domaine d'Aupilhac, you should. The Languedoc has long been the top producing wine area in France. Unfortunately, it has also been known for producing the worst wines in France. 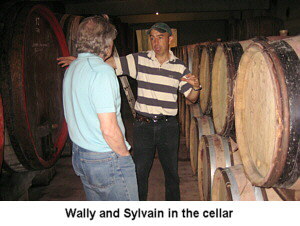 Sylvain and other vingernons (vintners) of a similar mind and dedication are changing all that. The night before we met with Sylvain we ate at Le Mimosa, a small but well-known restaurant in the neighboring village of St Guiraud. They served us a different wine with every course, all of them from the Languedoc. It demonstrated the diversity and quality of the wines coming from this region right now. It was a night to remember. Among the wines we tasted was a Carignan that was also made by Sylvain. It came with the cheese course and sang with the Roquefort (also from the same area). We're going to get that wine here if we can. And if you're ever in the south of France, you should get yourself to Le Mimosa. You'll be glad you did. Regarding the wines in our baskets, remember that you can select Domaine d'Aupilhac to be included in many of our wine baskets. It's a great wine and sells for $25. Great with lamb, steaks or just by itself. Cheers! Click Here to go to Sylvain's Domaine d'Aupilhac website.